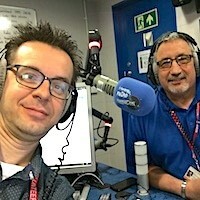 Mark Grantham and Colin Moore get together every morning for 3 hours of fun, games, quizzes and the brightest sound around in the Hillingdon Hospital. You can listen for FREE on your bedside Hospedia unit, or with FREE WIFI throughout the hospital, you can also listen with the Radio Hillingdon app or from this website via the Listen Live Player. Both Mark and Colin have volunteered with Hospital radio stations for many years, but it was only in 2015 when they came together to create the UK's most unwanted double-act! During the show, they reveal results from the UK's most unnecessary surveys, facts and teaser questions. There is the daily game which you join in with on their facebook page . They share events in the calendar, as they Name The Day, and champion new music with Mark and Moore's One to Watch. You can find them on air between 10am and 1pm from Monday to Friday. So if you're looking for something to do between Breakfast and Lunch, why not let them join you. Hospital Radio Hillingdon © 2019. All Rights Reserved.